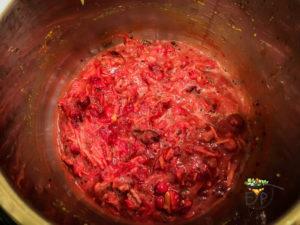 This Instant Pot Cranberry-Ginger chutney is simple to make in an instant pot or any pressure cooker. It is lightly spiced with turmeric, cayenne,chilies and sweetened with jaggery. Instant Pot Cranberry-Ginger chutney cooks up in less than a minute in the Instant Pot or Pressure Cooker. Spend time enjoying company of your friends and family, while instant pot makes this quick recipe for you. 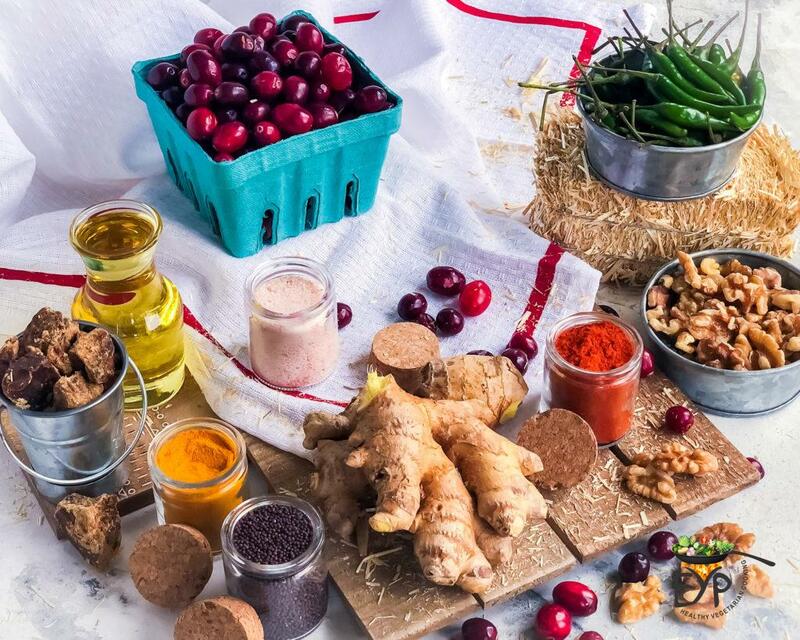 In addition, this Instant Pot Cranberry-Ginger Chutney can be prepared and refrigerate for up to a week,which makes it super convenient and readily available when in need. 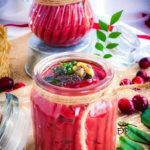 Cranberry Chutney a quintessential accompaniment to a holiday Spread. I got acquaintance with these berries after coming to USA only. Before that, I had no idea that such berries even exist. When I tasted cranberry for the very first time in its most popular form, yes guessed it right, ‘the cranberry Juice’, I hated it like anything. 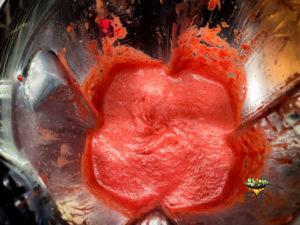 Do you know that 95% of cranberries are processed into juices and sauces? Well! back to cranberry story. After that first taste experience, for a long time I didn’t dare to try cranberries again in any form. But having cranberries again was written in my fate. One day during travel and I had serious craving for a muffin. All I could find was cranberry muffins at an airport cafe. That day, my craving for muffins over-powered the hatred for cranberries inside me. For the good or the bad, I bought that cranberry muffin just to have one bite to get that craving over. Perhaps, I was destined to taste that muffin and fall in love back with cranberries. I loved that muffin so much that I ended up buying one more yes ONE MORE! Hence, when back in town, I bought my first bag of fresh cranberries during next grocery shopping trip to give cranberry muffins a try at home. 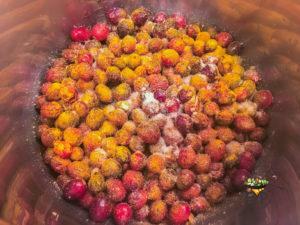 Since then, I have not looked back and to date continue to experiment with these berries in my kitchen. I have used them in muffins, cakes and now even a chutney (dip or sauce). 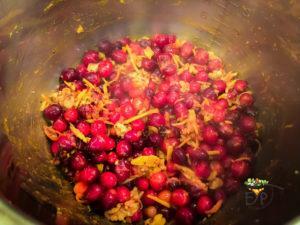 I am trying to incorporate cranberries in my kitchen in all possible forms for two main reasons. 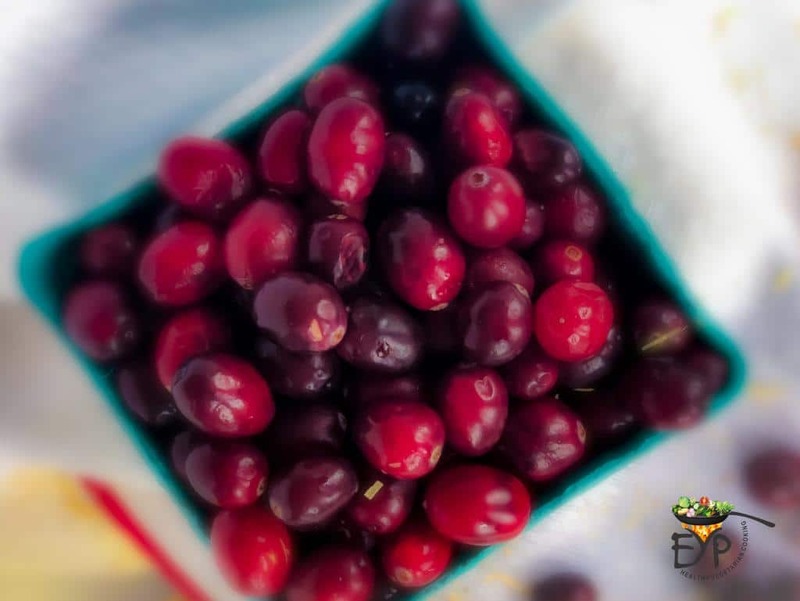 Firstly, the fresh cranberries are only available for a very short period of time, and if I missed this window then I have to wait for next season to enjoy fresh cranberries. Secondly, they ooze with tons health benefits. Cranberries are actually higher in antioxidants than any other fruits and berries. They are also lower in sugar than many other fruits and only contain four grams of natural sugar per cup. 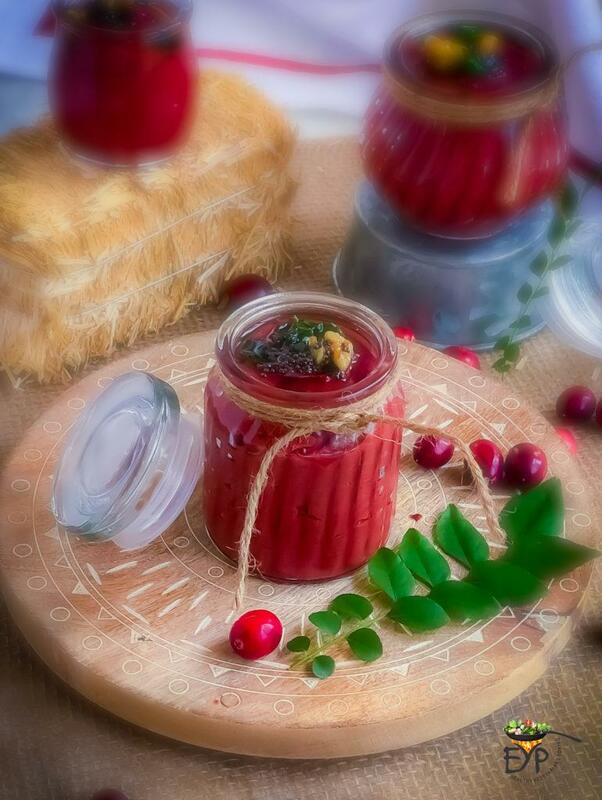 This cranberry chutney recipe comes from a friend of mine, whom I have not met in person but we have tasted each other’s food many times. How is that possible? We ship food to each other. She posted this recipe on a Facebook group, which we both are members of. I really liked the idea and concept of this chutney. 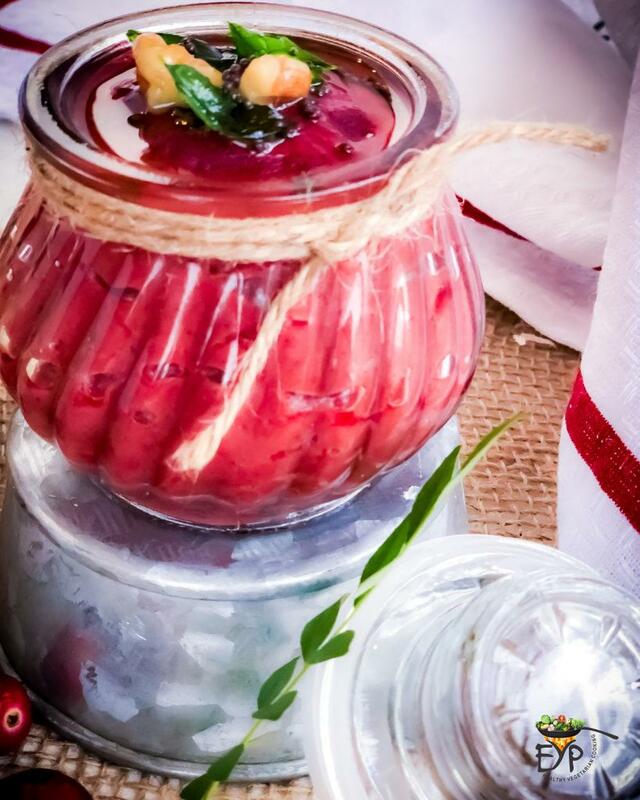 It is not just sweet, not just tart, but this chutney fulfills all the taste buds of sweet, sour, savory and spicy at the same time. 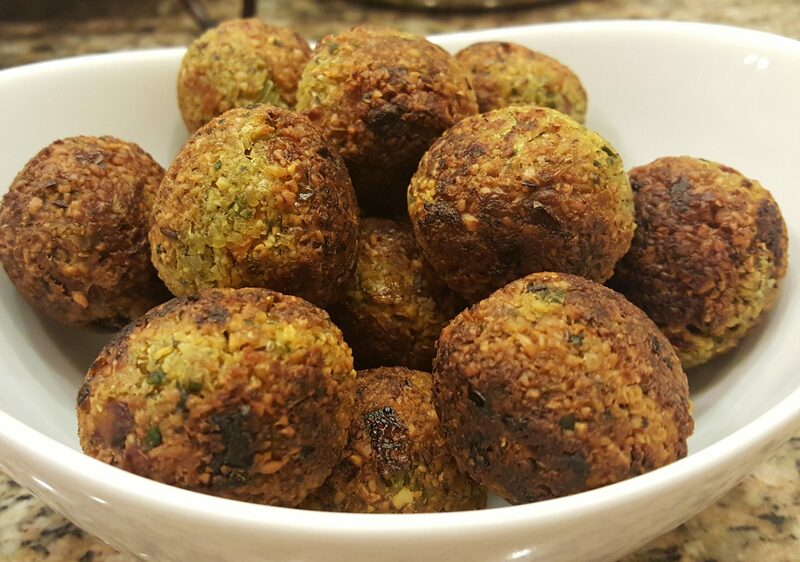 I tried the recipe few times and made few adjustments as per my family and kid’s preferences. Now, I have a deliciously invigorating new addition to my spreads and chutney collection. 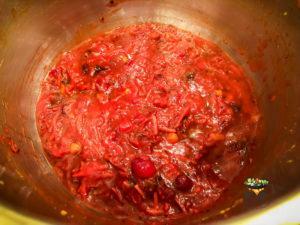 This chutney adds a yum factor to my kids wraps and kathi-rolls as spread. 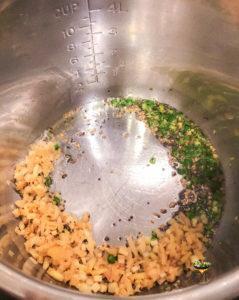 It adds unique pinch to the flavor to my dal-chawal or dal-quinoa. At the same time, it accompanies well with all sort of cutlets, puff patties, bread pakoras, dhokla (steamed cake), dahi-vadas, canapes. A great way to add flavor to your buddha bowl, salads and much more. Cayenne pepper – 1 tsp/ adjust as per your spice level. Add asafoetida and mustard seeds and let the seeds splutter. Then add green chili and ginger. Saute for 30 seconds. 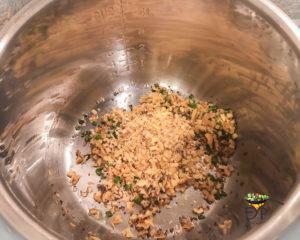 Add finely chopped walnuts and stir the whole mixture. After that add cranberries and all the spices. Give it a good stir to mix all the spices. 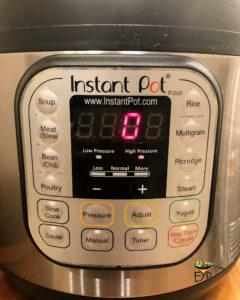 Add half cup water and close the instant pot lid. 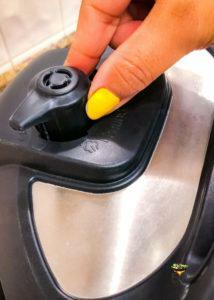 Press MANUAL or PRESSURE COOK mode for 0 minutes and let the pressure release naturally(NR). 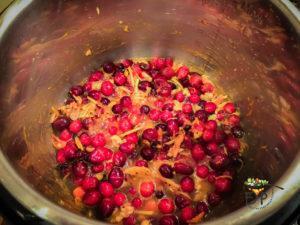 When float valves pops down, open the lid and crush cranberries with the back of spatula. 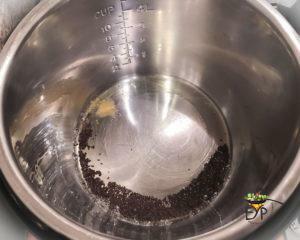 After crushing and mixing, add grated jaggery. 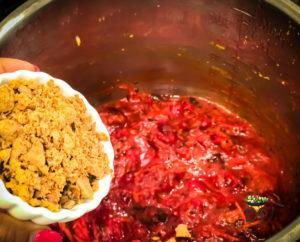 Stir and let it simmer on saute mode, at low heat setting until the jaggery is fully melted and mixed. 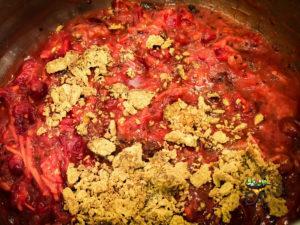 Turn off IP and let the cranberry mixture cool down to lukewarm temperature. 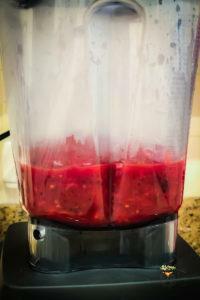 Transfer the mixture to a blender jar and blend it. 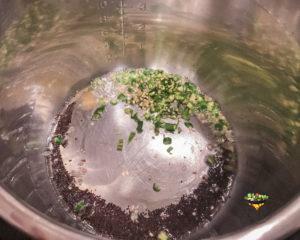 Transfer into a serving bowl and add a tempering of mustard seeds and curry leaves from top for additional flavor. For storage, transfer to a glass container with air-tight lid and store in refrigerator for up-to a week. 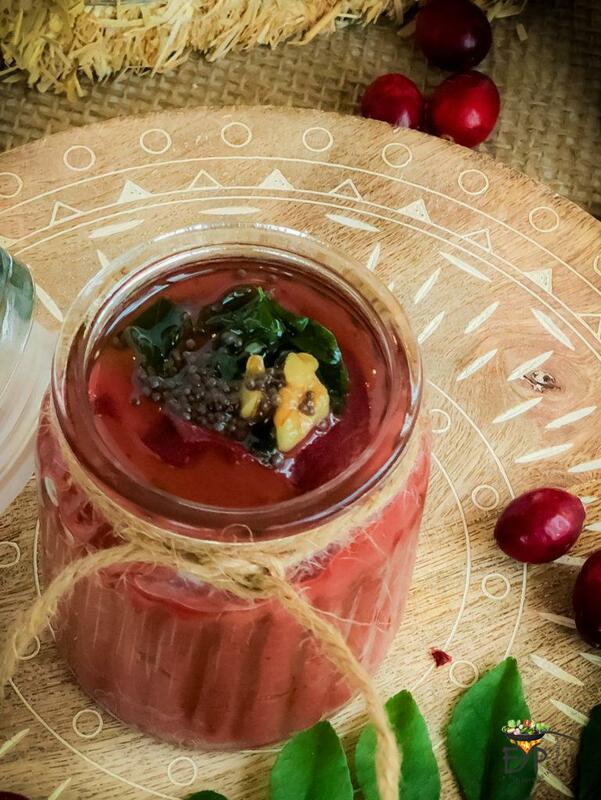 This Instant Pot Cranberry-Ginger chutney is simple to make in instant pot or any pressure cooker which is lightly spiced with turmeric, cayenne,chilies and sweetened with jaggery. Instant Pot Cranberry-Ginger chutney cooks up in less than a minute in the Instant Pot or Pressure Cooker. 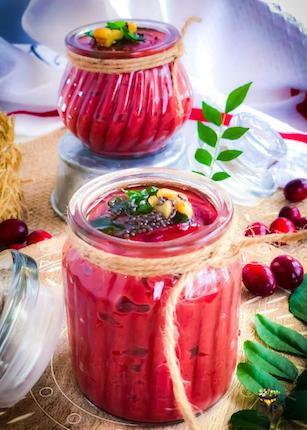 In addition, this Instant Pot Cranberry-Ginger Chutney can be prepared and refrigerate for up to a week,which makes it super convenient and readily available when in need. 1 tsp Cayenne pepper 1 tsp/ adjust as per your spice level. If you like the recipe and or try it, please show your support by sharing it with others via your social media accounts or other venues. If more people visit our blog, we can bring more recipes to you faster.